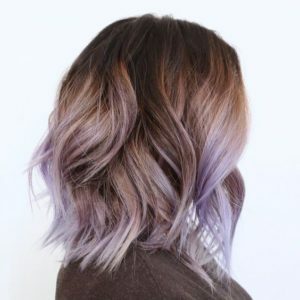 We’ve all seen the amazing Instagram posts showing off ultra long hair with a brand new balayage hair color, but you don’t have to have waist-length locks to pull off the color style. 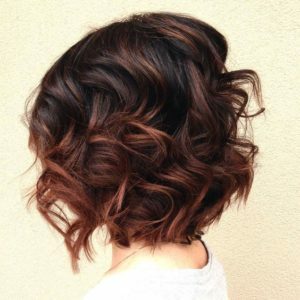 Balayage styles for short hair are picking up steam as this hair color trend is proving to be more than a passing fad. If you’re looking to add a touch of color to your long bob or a shorter pixie style, the balayage technique of painting on highlights can help your new shade to look soft an natural, even it it’s in a color like pastel peach or vibrant magenta. 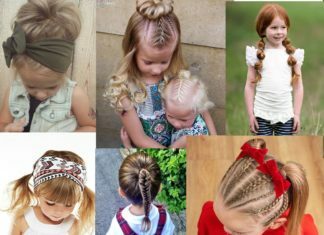 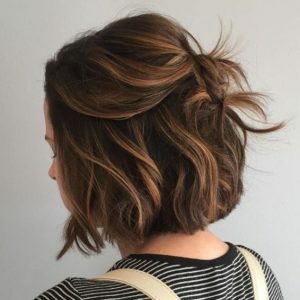 If you’re ready to add some new color to your shorter style, check out our favorite balayage styles and hair color ideas for short hair. The dark chocolate base of this textured long bob gets a huge pop of color thanks to a warm blonde shade applied using chunky balayage technique. Try this look out if you’re going for a high contrast color style that looks rich and sophisticated. 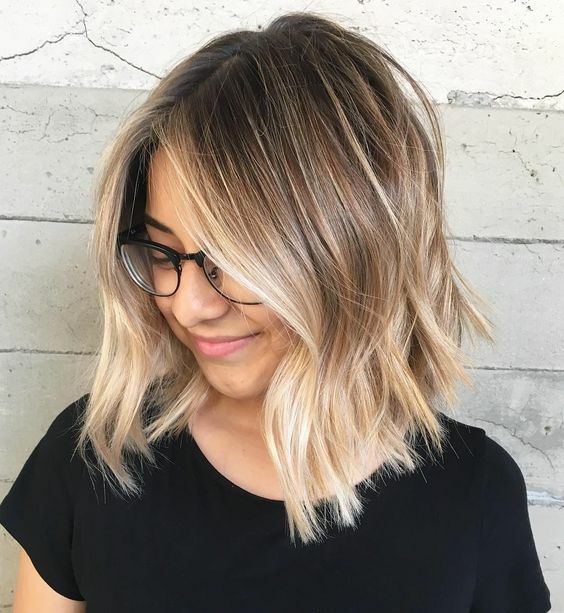 If you’ve got dirty blonde hair, this lighter blonde balayage is a natural looking addition to your bob that won’t completely make over your look. 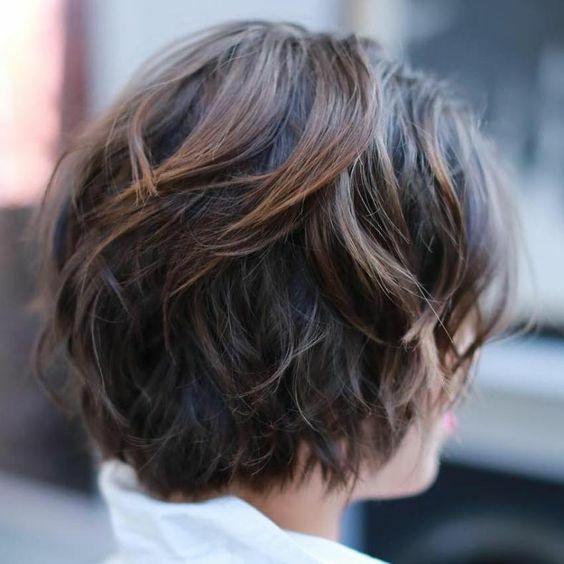 Highlights are concentrated in the front to accentuate the longer face framing pieces of this modern textured bob. We love how summery and chic this lavender shade looks against a medium brunette base color with hints of red undertones. 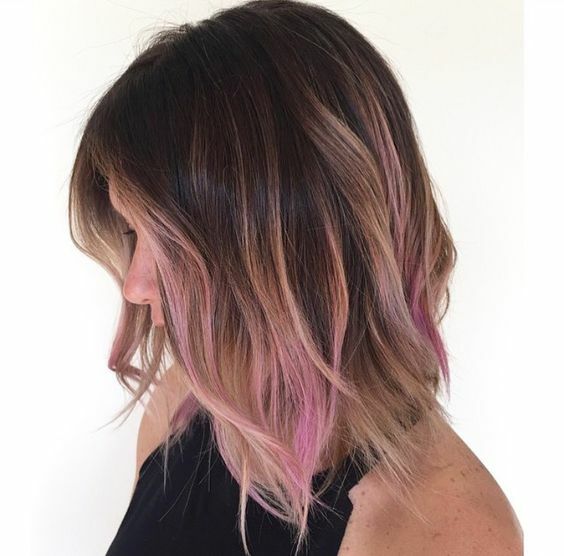 A pastel color this eye-catching can be applied sparingly and still create major effect. If your dark drown hair naturally pulls red tones or you’ve always wanted to experiment with red hair, this warm auburn shade will brighten up your short hair while still being subtle enough to fly under the radar. 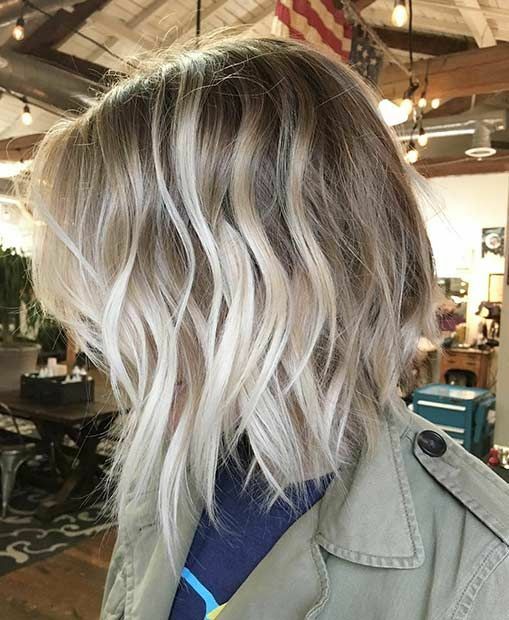 Ashy blonde hair gets a gorgeous pop of color with this nearly white platinum balayage. Try this style out for any season when you’re looking to make your hair look ultra light without coloring it directly from the roots. Very dark brown meets a warm golden blonde in this high contrast balayage style that’s set to turn heads. Applied in thick sections, this less natural-looking style is a great way to freshen up a bob that’s starting to feel flat in a one dimensional color. 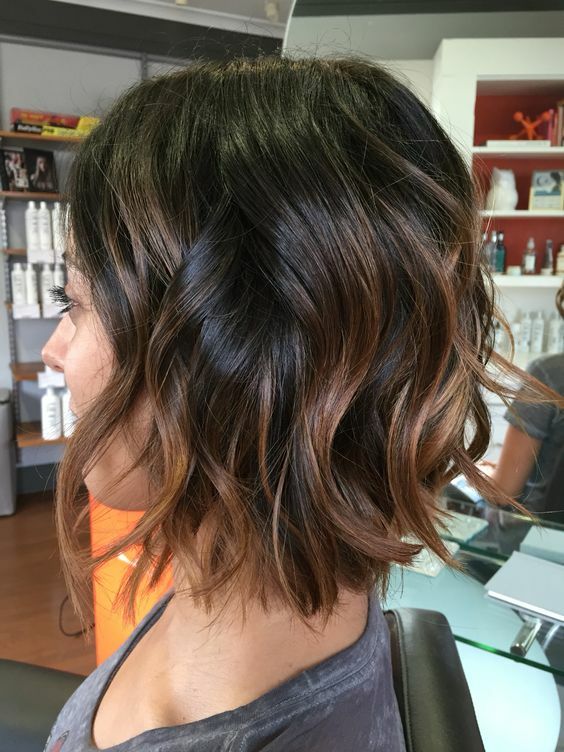 This ultra subtle balayage features more concentrated color at the ends, making it look almost like an ombre style. 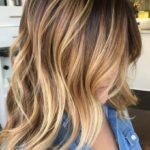 If you’re hesitant about experimenting with color, this scheme is one of the most natural ways to add balayage highlights to your look. 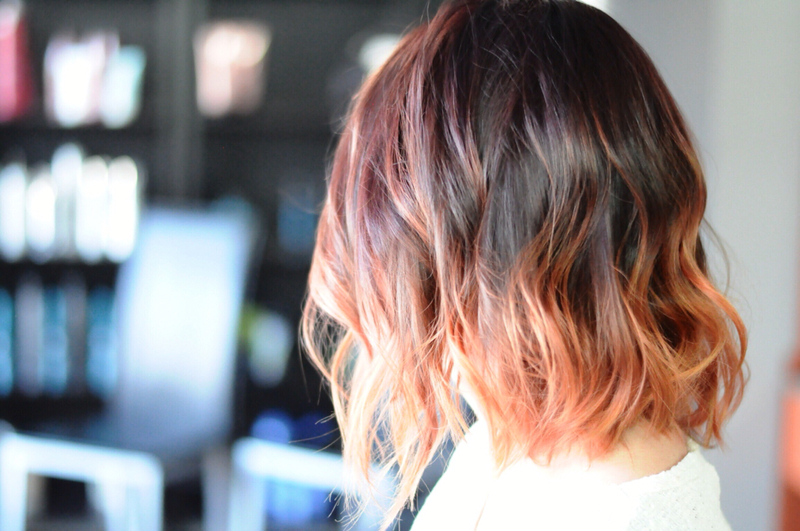 A warm copper balayage highlight is used to enhance the texture of this modern bob haircut. 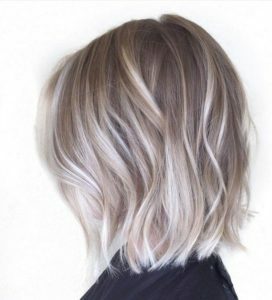 With a hybrid hairstyle that’s somewhere between pixie and bob, balayage highlights can be placed throughout longer pieces on top of the head to create the same painted-on effect. 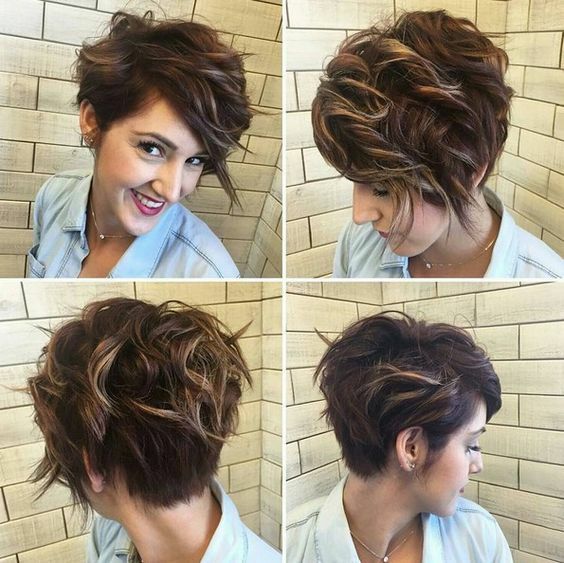 This style uses touches of blonde over a natural brunette base to enhance this short cut without looking distracting. 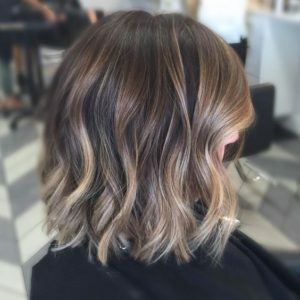 A warm blonde shade melts down the length of this medium brown lob, creating an incredibly rich color effect that will have people asking you who your colorist is and how far ahead they’re booking. 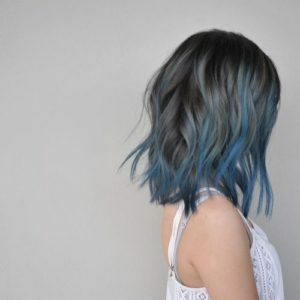 In this moody blue-on-blue hair color style, a greyish blue denim hair color gets some extra highlighting with a deep teal blue shade. Highlights around the face begin much closer to the roots, creating a balayage style that does extra work at framing your face. 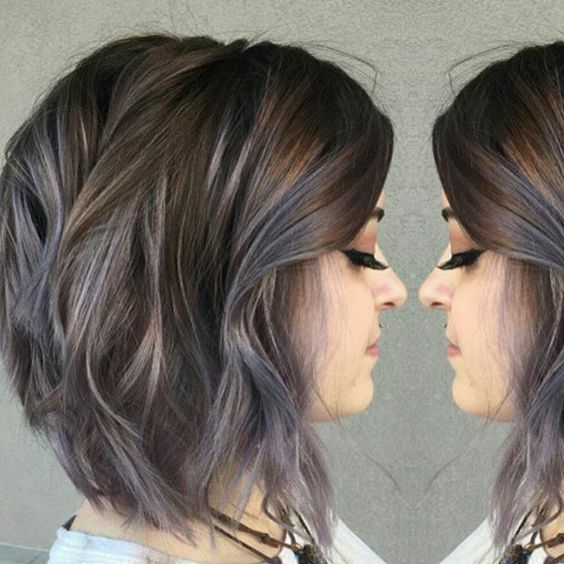 This hair color technique is a popular choice for shorter styles like this long, textured bob. 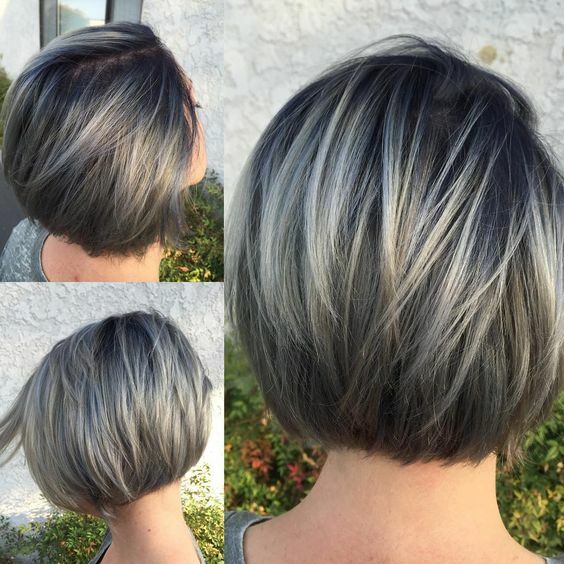 For the ultimate in high-contrast hair color styles, this black bob is enhanced with silvery platinum highlights. 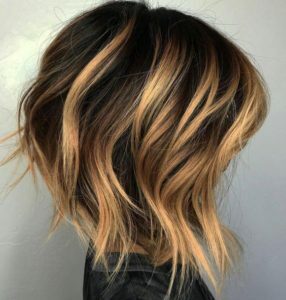 Some of this balayage color is applied slightly underneath hair’s top layer, giving it a neat peekaboo effect especially when hair is worn straight. A deep side part and thick long bangs makes for a sultry bob hairstyle that looks especially flattering on women with oblong faces. 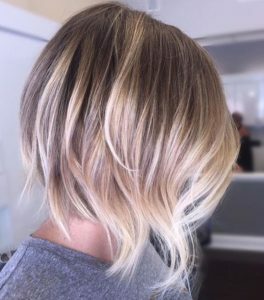 Blonde balayage throughout the bang section helps to enhance this haircut and makes a nice warm style to wear for spring or fall. 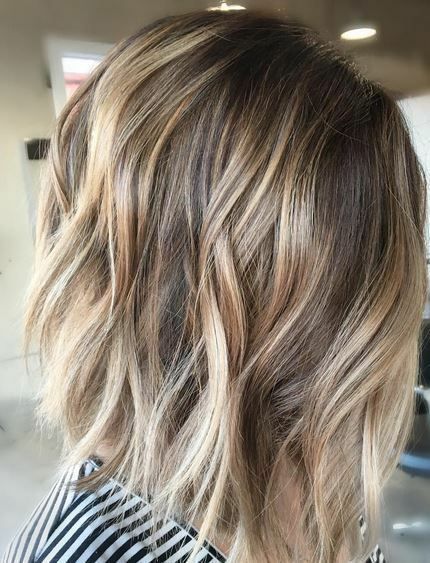 Warm blonde balayage over a darker blonde base is one of the most popular color combinations we’ve seen using this technique, and it looks incredible with any hair length. 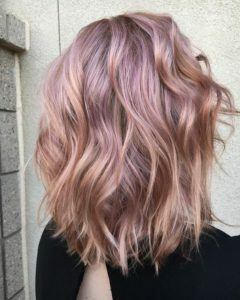 With a blush pink shade at the roots and a peachy blonde balayage overtop, this rose gold hairstyle pulls off an incredible interpretation of two of the biggest hair color trends. This shaggy bob hairstyle is a super fun way to wear shorter hair, and a great choice for women who either have a natural texture to their locks or don’t want a bob that looks too sleek and professional. Subtle balayage highlights look soft and natural, and help to enhance the layers and texture in this style. 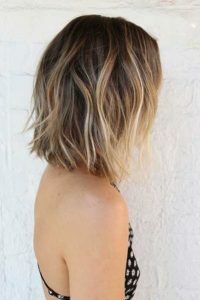 Add a buttery blonde balayage to your darker brown bob and your hair will be looking summery no matter what the season. A warm and toasty brown-on-brown balayage style will make your brunette locks feel special while still feeling like yourself. The denim hair trend offers up a more subtle, sophisticated take on the cool blue shade. 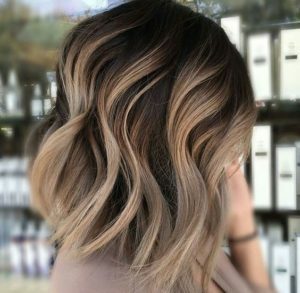 Luckily for anyone who’s commitment-phobic about their hair color, this trendy shade looks just as good in a balayage highlight as it does in an all-over color style. Use a subtle balayage highlight in a shade just a few lighter than your base color to add some depth to your hair without changing up your current vibe. 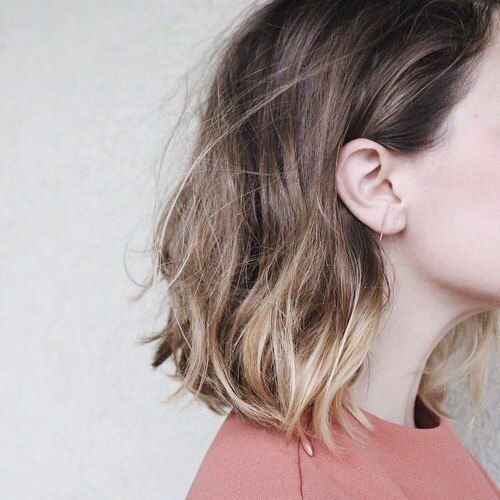 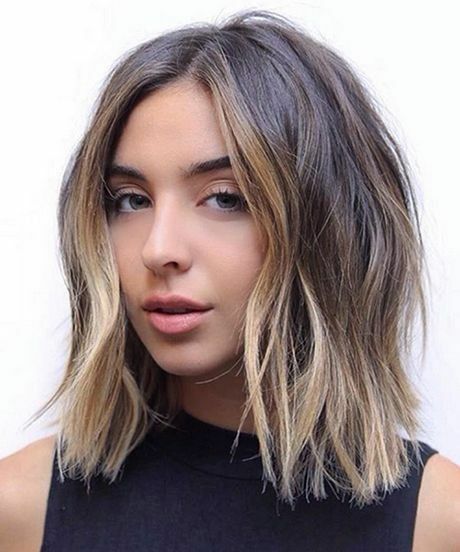 Light blonde balayage gets concentrated at the sides of this A-line bob hairstyle, showing off hair’s wavy texture and helping to add the illusion of depth and volume in hair that’s been feeling a little on the limp side. 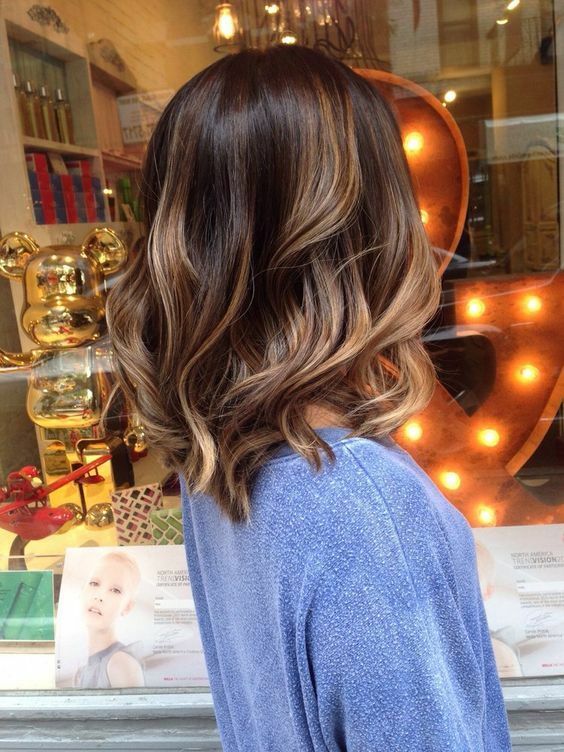 Sweet and subtle additions of warm blonde help to breathe new life into a brunette base color. Using an extra delicate touch, these highlights perfectly accentuate curls and won’t look overbearing when your hair is worn straight. 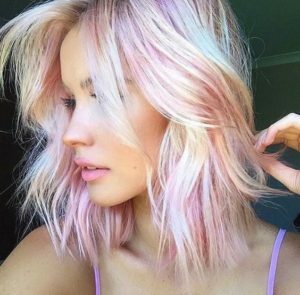 Pastel pink balayage on platinum blonde hair creates a fun, summery look, and lets even the lightest haired ladies try out this trend. Deep brunette and golden blonde make for a classic color combination that’s flattering on medium to dark skin tones. 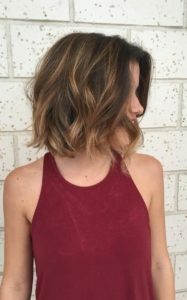 The textured ends of this collarbone-grazing lob get some extra love with this blonde balayage hair color, helping to accentuate the haircut using a color that’s super easy to grow out. 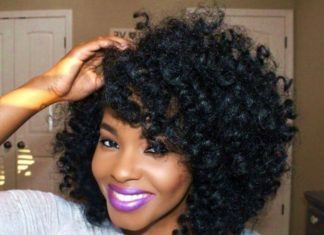 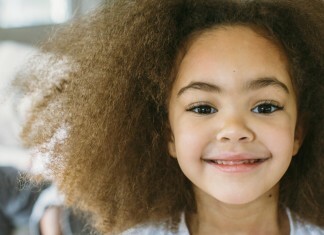 Natural black hair can be tough to highlight in a way that’s subtle yet noticeable. 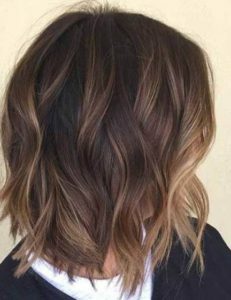 This balayage color style incorporates a chestnut brown shade though various layers of hair to create a gorgeous style for any season. 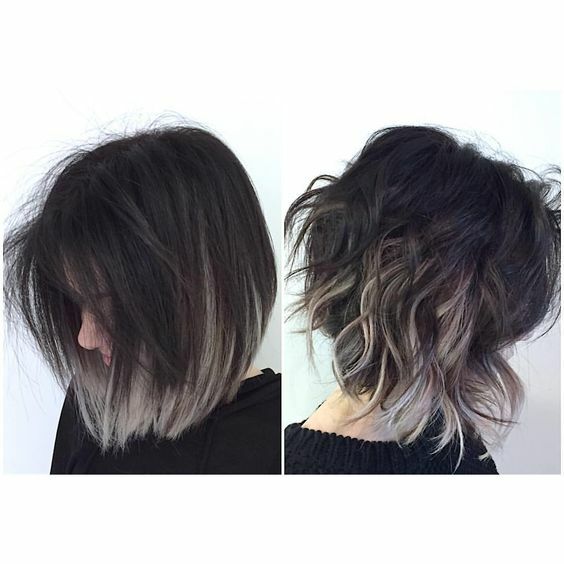 Silvery blonde balayage over a steely grey base color creates an antique-chic bob that looks sleek and trendy. A balayage with intermixed pink and blonde shades makes for a summery hair color that looks good enough to eat. 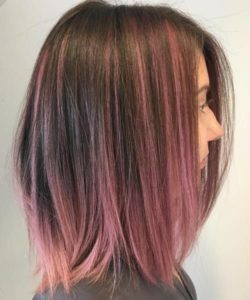 You can go for this style straight from a plain brown base shade, or apply a pink color overtop of existing blonde balayage for a refreshed color job that won’t require any additional bleaching. Proving beachy hair doesn’t have to be three feet long, this chill summer bob looks ready for sun and surf thanks to warm blonde balayage highlights. 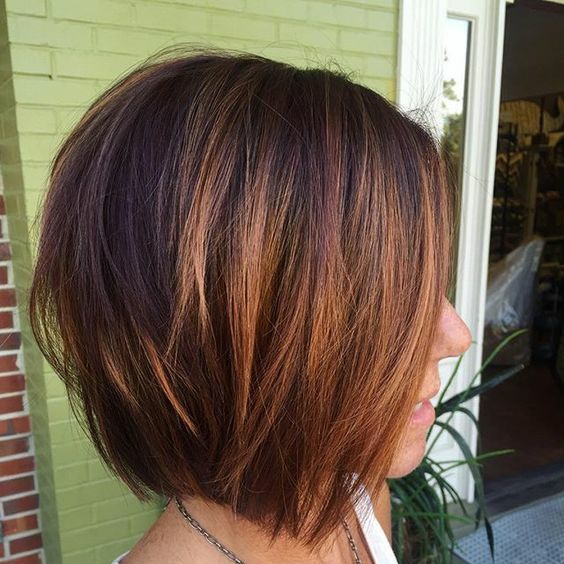 Warm, rich, and perfect for fall, this long bob style looks like it’s dripping in melted chocolate and caramel. 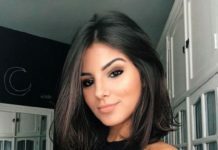 Women with dark or medium complexions with golden tones in their skin will be blown away by how flattering these colors look against their face. 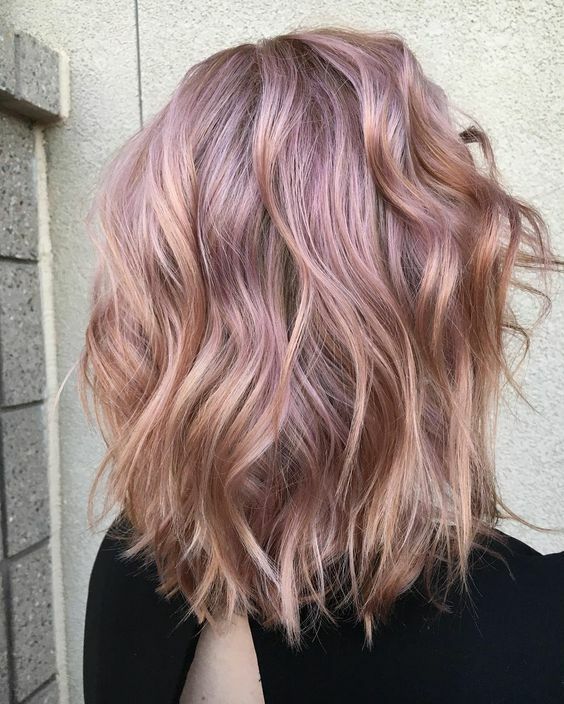 A muted raspberry color is the perfect pastel compliment to brunette hair, and helps to make brown or green eyes stand out against your skin. Thin ribbons of warm brunette are a soft and delicate way to warm up your natural brown base color. 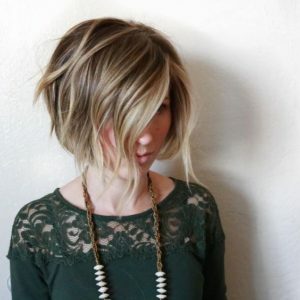 This evergreen style is appropriate for any season, and easy to grow out if you decide to make it a one-time thing. 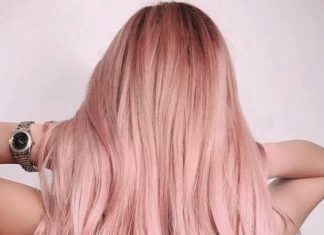 Peach hair may have once meant a bleach job gone wrong, but the delicious shade has been one of 2017’s top color trends. 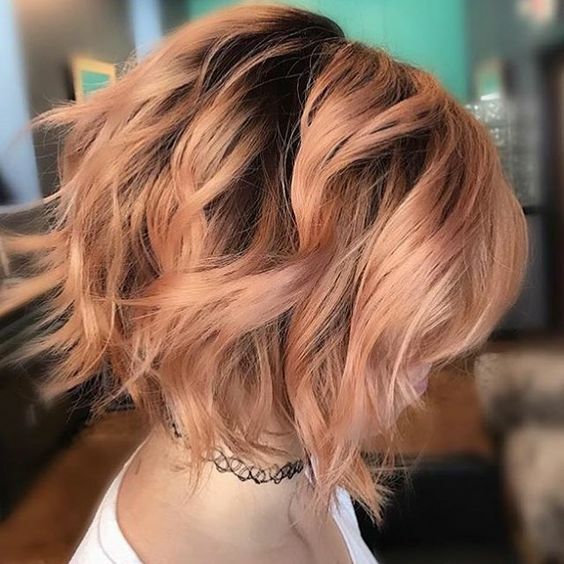 Chunky peach balayage is a nice way to add more color to your bob hairstyle, and leaves a hint of darker roots for some extra dimension. 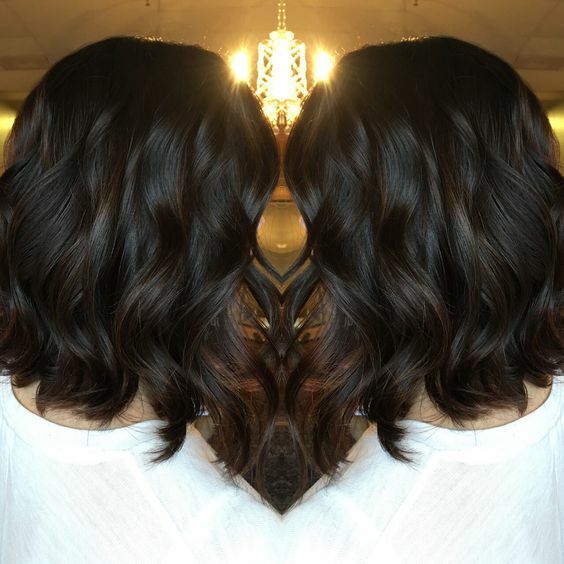 Probably the most subtle balayage style on our list, this long black bob has been ever so delicately enhanced with a rich brown balayage color. 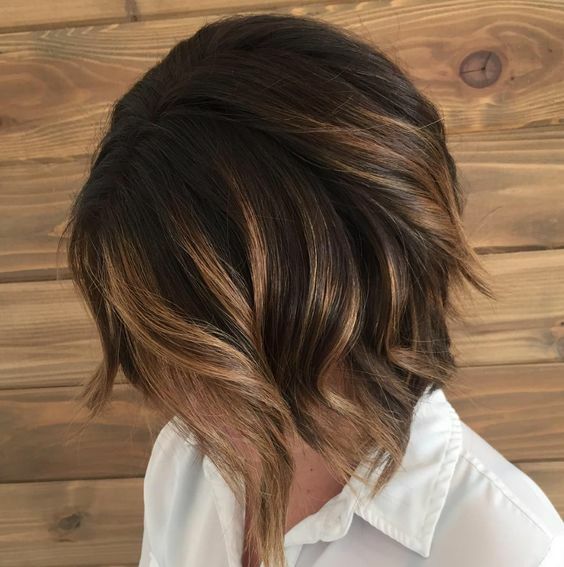 We love this style for women who don’t want to deviate from their natural dark hair color, or as a complete color makeover to a newly dark and multidimensional style. 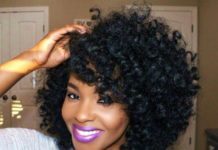 Beauty writer who loves books, travel, and buying too many hair products.